In keeping with our social justice goals, our program instructors are local artists from the Caribbean or of Caribbean ancestry who are experts in their field. They bring a unique perspective to the study of Caribbean music in the U.S. where classes are taught primarily by people outside of the culture. Instructors teach from a Caribbean perspective and offer strategies for teaching musical traditions that have been marginalized within a system that privileges Western art music and Eurocentric pedagogical methods. Danielle Brown is an artist-scholar and founder of My People Tell Stories, LLC. Her scholarly and artistic works are based on the premise that people of color in particular, and marginalized people in general, need to tell and interpret their own stories. Brown earned a doctorate in Music from NYU with a concentration in ethnomusicology and specialization in the music of Latin America and the Caribbean. Her work uses the arts to educate people on the history and culture of the African diaspora paying special attention to the Caribbean and its diaspora. Brown’s research has focused mostly on parang music in Trinidad, traditional and popular music in Cuba and Puerto Rico, and the intersection of music, spirituality, and healing. Brown is a former Assistant Professor of Music History and Cultures at Syracuse University, and has lectured at various colleges and universities. She has worked with elementary, middle, and high school students, and is certified in the Kodály method. Brown offers diversity education to music teachers and others seeking to dismantle the effects of systemic racism in the field of music. She is an active vocalist and cuatro player, and composes and performs jazz and Latin American and Caribbean-based music. Brown is author of the music-centered ethnographic memoir, East of Flatbush, North of Love: An Ethnography of Home. A musical adaptation of the book, sponsored in part by the Brooklyn Arts Council, premiered at Medgar Evers College in 2017. Goussy is a dancer, pianist, composer, teacher, and vocalist who has performed for the last two decades for audiences locally, nationally and in Cuba, England, Haiti, Wales, and Japan. She is a faculty member for the Middle School Jazz Academy and WeBop programs at Jazz at Lincoln Center. 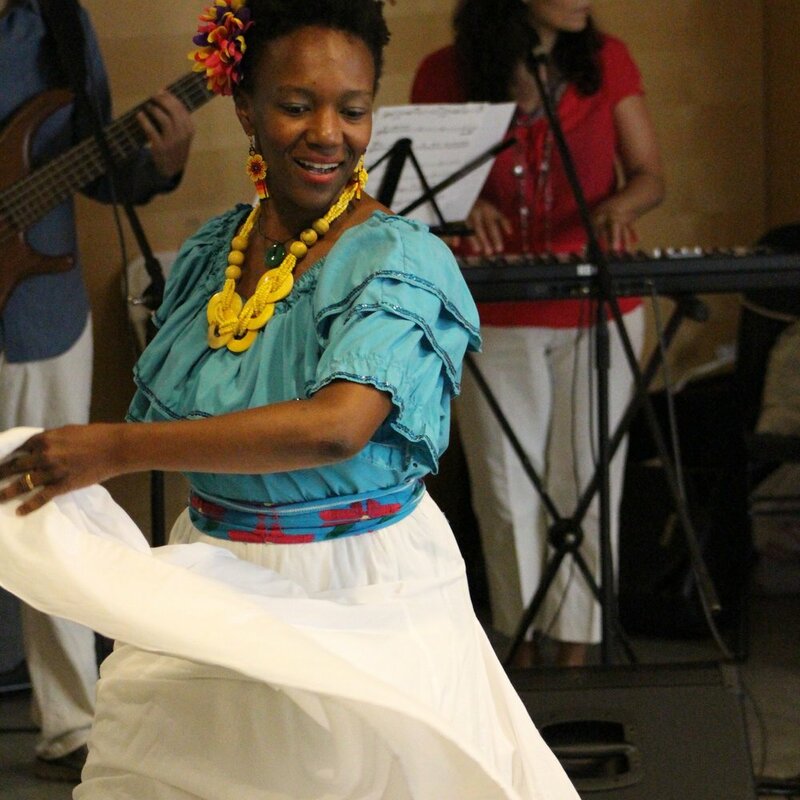 She is also a member of Retumba, an all-female music and dance ensemble dedicated to the afro-diaspora cultures in the Caribbean and Latin America. Goussy's current mission is integrating all of her disciplines in her project, Ayiti Brass, incorporating elements of traditional Haitian folklore and New Orleans street beat. Goussy is also a proud mom to her 5-year old and 8-year old sons, who give her a bigger workout than all her dancing and traveling combined! Maestro Renald St. Juste is a Haitian master drummer who grew up in Port au Prince, Haiti. He began drumming for ceremonies at the age of nine with his father, who was also a drummer, and strongly rooted in traditional culture and the Vodou faith. He also took part in many Rara celebrations, and learned to play the wind instruments associated with Rara music. When he was a teenager in Haiti, he helped form the popular music group "Rasin Kanga de Wawa". In 2009, a year before Haiti's massive earthquake, he relocated to Miami, and now lives in Brooklyn NY. He is regularly called upon to provide drumming at ceremonies and offerings, and is a performing member of numerous groups, including "La Troupe Makandal" and "Plezi Rara", two groups that contribute a variety of performance and educational programs that preserve and develop the remarkable music and dance traditions of Haiti within the community of New York City. Hansell Echualaibode grew up in Havana, Cuba. For more than five years he studied at the Conjunto Folklórico Nacional de Cuba, where he studied Yoruba, Palo, Abakua, Cha Cha Cha, Mambo, and Son. Former principal dancer for the Compañía de Danzas Tradicionales de Cuba JJ for over ten years, Hansell proudly brings his heritage and dance experience to his students around the world. Connect with Hansell Echualaibode on Facebook: www.facebook.com/Elegguaochanla. Born in the Havana province of Cuba, Miguel Valdes comes from a highly musical family, which includes his father, one of the top percussionists of the esteemed Conjunto Folklorico Nacional de Cuba. Valdes graduated from the Havana National School of Art Instructors (ENIA). After extensive training, he soon found himself with a flourishing career, and was performing all over Cuba across genres with several great musicians including Richard Egues, Tropicana, and La Ley. Valdes has collaborated with many talented musicians and groups, including Orquesta Filarmonica de Mexico, Gonzalo Romeu, Grupo Bandula, Elvis Crespo, Celia Cruz, Albita Rodriguez, Lena Burke, Emmanuel, Natalia Jimenez, Yomira John, Dennis D’ Kalaff, Ricardo Montaner, Miky Tavera, Yuri. In addition, he toured and worked regularly with Juan De Marcos Afro Cuban All Stars (Buena Vista). In 2010 Valdes left Mexico to come to US where he now resides permanently. Since his arrival he has collaborated with many American and Latino Artists like McCoy Tyner All Stars, Francisco Mela, Rachel Ferrer, Tony Perez, Kambalache, Steve Turre, Matt Dillon, Fellove, Patato Valdes, Elio Villafranca, Mac Gollehon, Vince Herring, Dion Person, Sexteto NY, Itai Kriss, Abdou M’boup, Alex Matos, Nachito Herrera, Michel RoosWomen & New Yoruba’s, Los Hacheros, Cotton Club Big Band, Willy Chirino, Sister Sledge-Debbie Sledge, Frank Owens, Ty Stephens, John Faddis, Terell Stafford. He has three of his own CD’s and has recorded with more than forty different artists. Michael Manswell, Artistic Director, Teaching Artist, Choreographer, Singer began his performance life as a storyteller at Arts Festivals in his native Trinidad & Tobago, winning many prizes and awards. He studied music with Lindy-Anne Bodden-Ritch at St Mary’s College and at Brooklyn College (CUNY) with Tom Cultice. As a singer he has toured Europe, the UK, and the Caribbean and has performed as a soloist in many productions of opera and oratorio including Dido & Aeneas, The Marriage of Figaro, Die Fledermaus, Beethoven’s 9th Symphony, Handel’s Messiah, Missa Criolla and Missa Luba. He studied dance at the Trinidad Dance Theater with Dr. Eugene Joseph training in Modern, Ballet, Jazz, Ballroom, and Folkloric styles. Michael worked with Geoffrey Holder on “Dougla II” and “La Valse des Bakas” for TDT and toured with the company in the USA and the Caribbean. A prolific choreographer he has created several works currently in the repertoire of Something Positive Inc, the performing company he now directs. 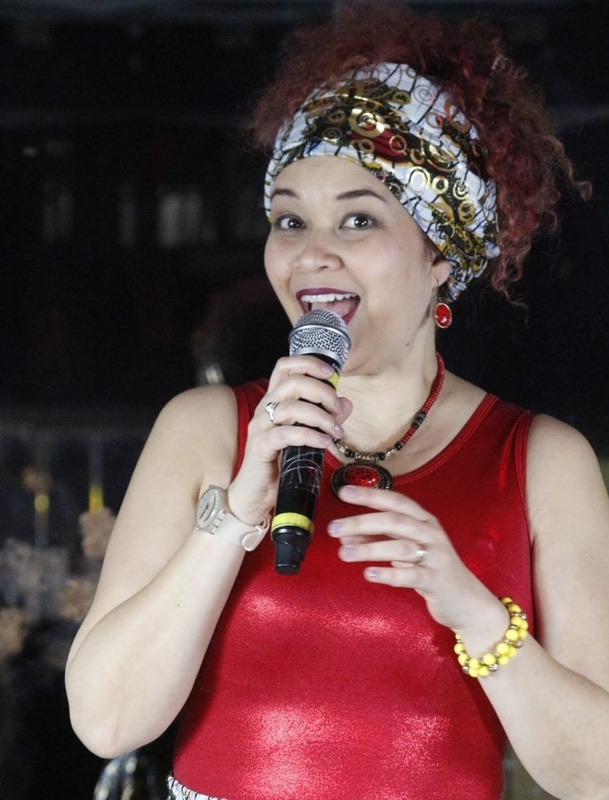 Something Positive has recently returned from performing in Morocco and the Ivory Coast and has also performed in Costa Rica, Belize and Trinidad & Tobago. 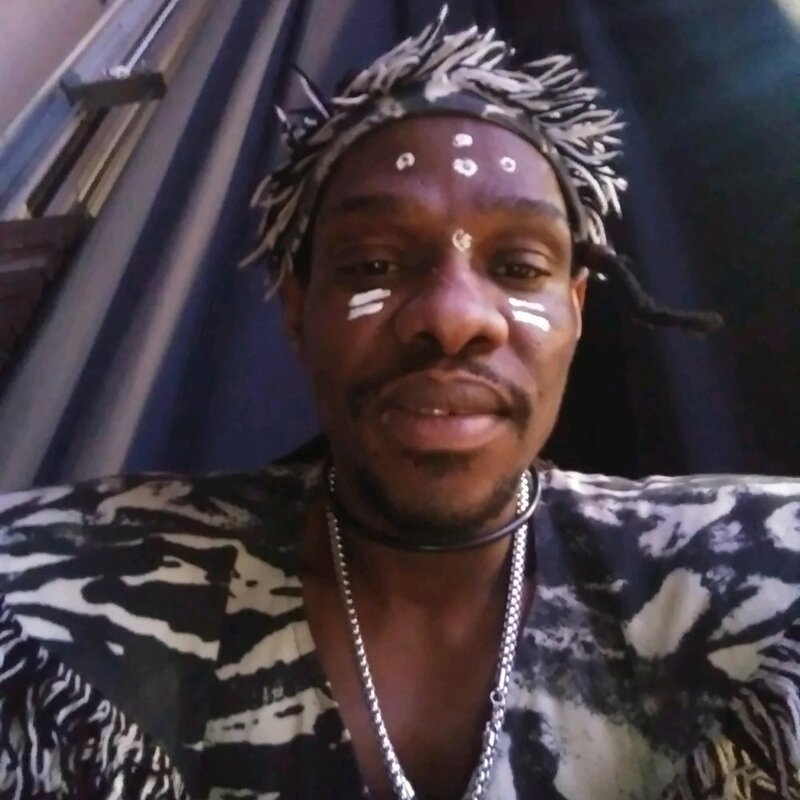 An avid folklorist and an Orisha devotee in the Yoruba religion, Mr. Manswell presents lectures and workshops in dance, music, and traditional religious practice and works closely with the Caribbean Cultural Center and the Interfaith Center in their programs. One of “Brooklyn’s Black Men of Distinction 2000” and one of “Brooklyn’s Black Dance Kings (2010)”, Michael is currently an Adjunct Prof (Dance) at Lehman College (CUNY) and teaches for Something Positive Inc., Purelements An Evolution in Dance, the Caribbean Cultural Center African Diaspora Institute (CCCADI), and E.M Techniques. Contact Michael Manswell at www.somethingpositiveinc.org. Born and raised in Trinidad and Tobago, Zane Rodulfo began studying and performing music at an early age. He completed graduate work in Jazz Studies at New York University and holds Bachelor of Music degrees in both Jazz Performance and Ethnomusicology from Oberlin Conservatory of Music. Zane has opened for acclaimed musicians such as Stevie Wonder and has share the stage with award-winning musicians such as Nicholas Payton, Brian Lynch, the legendary Barry Harris, and Wess Anderson. He has performed at notable venues, including Jazz at Lincoln Center and the Blue Note. Zane released his debut EP ‘Pathways’ in 2016 on his label Lavway Music.